Daniel over at Mailanka’s Musings has a nice post on Map-Making in Theory and Practice. In short: a million times yes. I have to echo his throughts on Maps and Inspiration: a good map is really, really inspiring. It works both ways, too. In my Torengar/Nordlond setting for Dragon Heresy and Hall of Judgment and Lost Hall of Tyr, the map came first. I set up a history using Microscope and another “game to play a game” kit that I can’t remember anymore that helped set up the long prelude to the current state of the main realm. I drew up some key terrain features that appeared to be important, and then commissioned Cornelia Yoder to make me some maps. I have since been leveraging those maps heavily in making the details of my setting sing. This is particularly true of the mini-setting I’m working on for what will hopefully be my first-quarter Kickstarter: The Citadel at Nordvorn. Featuring the titular town of Nordvorn with its adjoining citadel, there are also three other important towns and villages of note, one of them destroyed. The town of Ainferill (Riverbend) sits about 40 miles south of Nordvorn on the Jotunnain (a river; áin means river; I think properly conjugated it should be Jotunná, but I have it as “fun” that the northern areas use áin and the southern areas use á, as sort of a regional accent thing). It’s a town of about 1,000 souls, or about 200 families, give or take. It’s the seat of a Jarl, the second tier of noble, but they still have to get the king something like $10M per year in GURPS moneys, or about 200,000 gp in D&D moneys, as a Duty to keep the title. Just north of Ainferill is the slightly smaller (750 people) town of Vegghofn (Sallyport), which marks the last easily-accessible break in Audreyn’s Wall (think in between Hadrian’s wall and the Great Wall of China) until the other side of a mountain range that the wall jogs around for Reasons. Anyway, point is: I am detailing these three settlements. What are the important guilds? Why have guilds at all? What industries or products make each town unique? Why should there be a town here at all? This is my realm map. What can I say about it? Well, it’s got heavy forest, plains, and lightly wooded or intermediate areas. These divide out nicely into “logging and forestry,” “grazing lands,” and “farming” when it comes to surplus products for more than just surviving. It’s a high-level thing, but it’s informative. The cities cluster densely in the farming area (blue). More food, better climate, more trade, higher population density. The capital is also there. Hey, what do we have here? A slice of Nordlond/Torengar, with Isfjall from Hall of Judgment in the west, and stretching to Midgard in the East. From Isfjall to Midgard and beyond. Still copyright Cornelia and licensed to me. Northwatch is Nordvorn – one means the other. But it’s maybe 250 miles east of Isfjall, so it’s a hike if you walk it. But why would you? Take a boat and sail down the Wodenain to Nethanfoss, then it’s maybe 50 miles along the “Palisade Road,” which isn’t shown on the map. That should be an exciting trip, since the area to the Northwest of the Palisade is called The Hunted Lands, home to marauding faerie and more than its fair share of monstrosities, undead, constructs, and other things that wish to eat you. But the map informs this. How long will it take to get there? Well, big rivers tend to move at a few miles per hour, 1-5 mph not being unusual. So the 200 mile trip on the river could be as fast as 40 hours, or two days, or as long as a week. Plenty of time in either case for a few encounters with river raiders or river-dwelling monsters, but not so long that the game will drag. That last 50 miles to Northwatch from Nethanfoss is probably a few days hike as well, and while the path/road is guarded, it’s still dangerous lands. That makes Nethanfoss a very interesting market. It has access to both grazing lands, water, and abuts the Einmanna forest. And it’s a crossroads, being the natural departure point for goods to come east from the settlements along the Wodenain. All this from the map. Now we venture south from Nordvorn, because there’s been a rumor that the Jarl is hiring adventurers. Or maybe killing them. It’s Nordlond: perhaps it’s both. In any event, what’s going on at the Riverbend? Well, it’s got woods. It’s adjacent to a metal-rich mountain/range. It’s got grazing land. And it’s at a convenient stopping place for ships coming upriver to rest and get ready for a hard pull into the faster-flowing stretch of the river from Ainferill to Nordvorn. If you do a bit of line work, you can see that the Jarl probably controls about 265 square miles of land, and about half of that is grazing land – ideal for sheep – that is mostly plains. The other half, to the north and west, is lightly wooded, leading to thicker woods in the Einmanna Forest. OK. So we have wood, metal, wool, and cattle and goats. This is a shipbuilding town. It’s also one of the towns (the two south of Ainferill and west of Jarngardr are two more) from which a whole lot of sheep are raised and turned into wool, cloth, clothing, and other products. This is a jarl whose income depends on wool, cattle, ships, and trade. That’s what he’s going to care about, and that’s where threats to his power – or extensions of it – will come from. Does he mine in the hills just across the river? Does the hajarl of Midgard resent this? Ainferill could sit in the demesne of either Northwatch or Midgard – are the jarl’s loyalties solid, or being tested? What about bandits? Or monsters? If you do the work, something that between some expert help and the Adventurer Conqueror King books domain rules make easy, you can see that monsters or monstrous people killing or taking livestock will really honk off our jarl, as as much as 25% of his Duty – maybe more – can come out of the income stream from wool and cloth. But . . . karls (freeholders) own their own lands. How does that work? Well, that’s where the guilds come in. That worked out nicely too. I spent a lot of time last night working with the map, agricultural data, and conversing with some experts to turn this slice of Nordlond into a living world. Not only is it living and hopefully provides some immersive detail, but it becomes something from which you can really see how folks might wish to bring an adventuring party on board to deal with problems. Suffice to say that the tie of personality, economics and trade are all made more obvious with a good map. A map, a knowledge of what can be grown and made with certain natural resources, a feel for the personalities of the leaders and citizens and what they care about . . . and the adventures flow easily. Especially when the area in question has recently undergone some . . . rather dramatic calamities. Stay tuned. Hopefully you’ll see this one pop up in the first quarter of this year! Thursday is GURPSDay, and marks the first full week of 2019. It’s been a bit of a crazy week for me, as schedules are only now returning to normal after break (the kids are back in school) and trying to work out a good balance of writing and doing other things. There are, however, things to do. I am busily writing The Citadel at Nordvorn, a mini-setting with far too much going on for its own good, for the Dungeon Fantasy RPG. This is the first of three works that will be published for that game in 2019. As noted in my brief post today: I’m having ridiculous fun writing it. Convenient Aircraft Carrier for Scale. I’m busily writing The Citadel at Nordvorn, Gaming Ballistic’s next return to the world of Nordlond (known as Torengar in Dragon Heresy). This one’s a mini-setting, focusing on the events and interactions between important players (including the characters!) in the lands surrounding this vital town. I am having ridiculous fun putting these towns together. I just finished the description and detailing of Nordvorn itself. I am moving on to the other two important towns in the book, Ainferill (Riverbend) and Vegghofn (Sallyport). The compact nature of the towns – Ainferill and it’s roughly 1,000 inhabitants sits on a chunk of land and water about 25 acres in size. That’s a circle about 350m in diameter, which is basically the size of The O2 (formerly the Millennium Dome) in England. That is, the entire village would fit inside it. Even the much larger keep and town of Nordvorn is only 7,500 residents and its longest dimension is only three times that of Ainferill. These are little places, relatively speaking, which means they can truly come alive with detail. I certainly hope that you enjoy visiting them as much as I am writing them. Some fun bits from the draft. Subject to change, of course. Presented entirely lacking context or structure. A name like that invites hubris, but the Eilífur Brú has the chops to merit the name. The walls are over 20 feet thick, the columns, supports, and span magically melded with the strong rock of the river gorge. It has stood up to wind, weather, and thrown boulders from trolls and hill giants, as well as projectiles from siege engines. The bridge begins with a massive structure known as The Terrace Gate, which as its name implies houses a series of massive doors each on a different level of the structure. The Terrace Gate actually enters a hundred feet or so below the top of the eastern gorge wall, and the winding staircase with interlocking gates, murder-holes, and other defensive emplacements is called The Spiral. The town side of the Eternal Bridge ends in a large walled enclosure as well. There are barracks, training grounds, and defensive emplacements, and the entire structure would rank as one of the notable fortifications in Nordlond if it weren’t immediately adjacent to the Citadel itself. The closest tower and sallyport to Little Rock. Even more than the other city gates, the Hunting Gate is constructed to be used, and frequently, for war. It is staged to allow sorties from within the Lower Town when needed, as well as the point of departure for those thegns, huskarls, and Wardens who attempt to keep the people and goods coming out of the Hunted Lands safe. Or at least safer. Thievery is forbidden. Sneaking around and taking someone else’s property is punishable by outlawry and thralldom. However, challenging someone to combat over a coveted possession, or facing them in some sort of fight, real or provoked, allows the victor vast leeway in claiming spoils of battle (in some cases this can include property and in older times, even family). Property obtained in this manner is called sigurtakn, (“victory token,” or “trophy”) and is considered honorable. Well, at least valorous. Dangerous, perhaps? A man bedecked head to toe in armor and weapons that are all sigurtakn is a man to be kept at arm’s length. Such people are called dýrð-óðir, or “glory-mad,” (behind their backs) and given the same sort of respect you give a scorpion, venomous snake, or feral dog – admiration for their deadliness, but not someone you turn your back on. Ever. I am making slow but steady process on The Citadel at Nordvorn, my first of three upcoming supplements for the Dungeon Fantasy RPG. 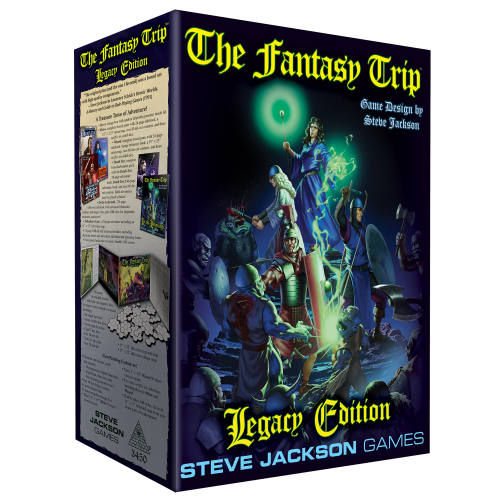 It’s set in the same world as Hall of Judgment, but will easily be portable to any other game world with the right tweakage. I can see Nordvorn as it takes shape, and each area of the Lower Town, and the interesting places the PCs can visit, is plunking down on the map with ever-increasing certainty. Citadel is not an adventure, as such. It is a web of locations and interactions, in which the players can find adventure. So it’s more of a mini-setting. But it is, by far, the most detailed and specific thing I’ve done. Not “detailed rules,” because it’s not that sort of supplement. But the GM and players will know/can find out where to find all sorts of stuff. I was impressed when Rob Conley had all the rich descriptions of what shops and trades we were walking by in his Harn-inspired city that we played in way back when. I think Nordvorn will be like that. I’m really looking forward to the maps.